2054a, Hubcap center used, 15", 89-93, CADILLAC, DEVILLE, ELDORADO, FLEETWOOD, SEVILLE. RED BACK GROUND & SILVER LEAF & GOLD CREST. 3 CLIPS, 3-3/4" DIA. ALSO AVAILABLE WITH SILVER CREST & GRAY BACKGROUND, FITS BOTH A & B HUBCAP, CENTER SOLD SEPARATE. 2054a, Hubcap center used, 89-93, CADILLAC, DEVILLE, ELDORADO, FLEETWOOD, SEVILLE, RED BACKGROUND, SILVER LEAF, GOLD CREST, 3 CLIPS, 3-3/4" DIA. 285, Hubcap used, 14", 65, AMERICAN MOTORS, RAMBLER, CLASSIC, POLISHED FINISH, 12 BLACK PAINTED RIBBED POCKETS, RED BACKGROUND, "R" LOGO, METAL CLIPS. 313, Hubcap used, 14", 67-68, DODGE, PASSENGER, RIB TYPE, POLISHED CAP, BLACK PAINT BETWEEN RIBS, RAISED CENTER, RED BACKGROUND, LOGO, METAL CLIPS. 324, HUBCAP USED, 14", 68, CHRYSLER, PASSENGER, EXCEPT 300, NEW YORKER, NEWPORT, POLISHED CAP, BLACK PAINT BETWEEN RIBS, RIB TYPE, WITH CENTER DOME, 3 SPOKE CENTER, RED BACKGROUND, CHROME WORD CHRYSLER, METAL CLIPS. 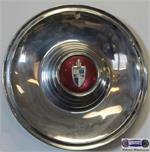 4093, HUBCAP USED, 14", '83-'88, OLDS, CIERA, CHROME OUTER RING, MACHINED FACE, SLOT TYPE, RAISED RED & WHITE EMBLEM, METAL CLIPS. 4093, HUBCAP USED, 14", 83-88, OLDS, CIERA, CHROME OUTER RING, MACHINED FACE, SLOT TYPE, RAISED RED & WHITE EMBLEM, METAL CLIPS. 62134, CENTER CAP USED, '80-'83, NISSAN, DATSUN, 200SX, CHROME PLASTIC CAP, RED BACKGROUND, CHROME D, 8 NOTCHES ON OUTER EDGE, 3-1/4" DIA. 62134, CENTER CAP USED, '80-'83, NISSAN, DATSUN, 200SX, CHROME PLASTIC CAP, RED BACKGROUND WITH CHROME D IN CENTER, 8 NOTCHES ON OUTER EDGE, 3 METAL CLIPS, 3-1/4" DIA. FOR A 14" RIM. 69157a/69271b, CENTER CAP, USED, 78-83, TOYOTA, COROLLA, CHROME WITH RED CENTER WITH RAISED CHROME LOGO, PUSH ON TYPE. 2-1/4 X 3" DIA. 724, Hubcap used, 13", 74-78, FORD, MUSTANG, WIRE DESIGN, CHROME OUTER RING, 8 SLOTS, INNER RING, WEBBED OR CROSS SPOKE, RAISED ROUND CENTER, RED BACKGROUND, CHROME HORSE LOGO, METAL CLIPS.